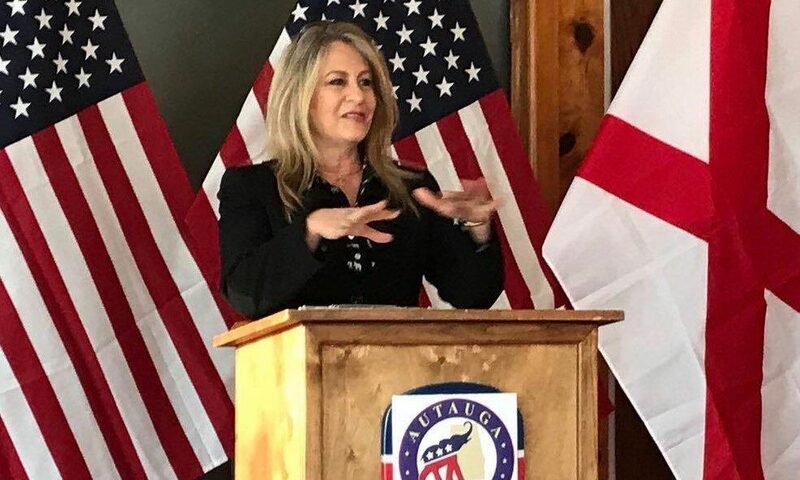 Chairwoman: ALGOP is "building an army"
Alabama Republican Party Chairman Terry Lathan spoke to the Mid-Alabama Republican Club at their regular monthly meeting in Vestavia Hills on March 9. MARC President and former state Rep. Paul DeMarco, R-Homewood, asked the group for a moment of silence to remember the 23 people killed when a Tornado touched down in Lee County earlier that week. Chairman Lathan said that the Chair of the Republican National Committee, Ronna Romney McDaniel, had called to check on the state following the tornado. “Right now we are building an army,” Lathan said. Lathan said that the 2018 election was enormously successful for Republicans in Alabama. The Alabama GOP won every statewide race, elected Governor Kay Ivey, grew GOP supermajorities in both Houses of the Alabama Legislature, and now control an unprecedented 65 percent of the elected offices in Alabama with a party affiliation. Lathan said that she agreed with state Representative Jim Carns, R-Vestavia, and that Republicans should not form “a circular firing squad” in the aftermath of the gas tax vote by the state legislature. Secretary of State John Merrill (R) agreed with Lathan about Jones’s controversial comments. “He is entitled to his own opinion, but he is not entitled to his own facts,” Sec. Merrill said. Merrill said that he is awaiting additional indictments in Brighton. We will put Brandon Dean in the penitentiary for voter fraud. Merrill said that his office has already gotten six convictions in this state for voter fraud. Merrill said that he has explained what the state is doing to encourage voter participation to Hillary Clinton, Bernie Sanders and John Lewis. “We have done a lot and we are going to do a lot more,” Merrill said. “91 percent of all Caucasian, white, or whatever you want to call the majority of the people in this room are registered to vote in Alabama. 94 percent all voters are registered to vote and 96 percent of all Blacks are registered to vote. Merrill said that the national media does not report that because it doesn’t fit their narrative. “We are making it easy to vote and hard to cheat,” Merrill said. A member of the audience asked Merrill to run for the U.S. Senate seat held by Doug Jones. The Mid-Alabama Republican Club meets on the second Saturday morning of each month. The 2020 Alabama primaries for U.S. Senate, President of the United States, and other offices are less than a year away.